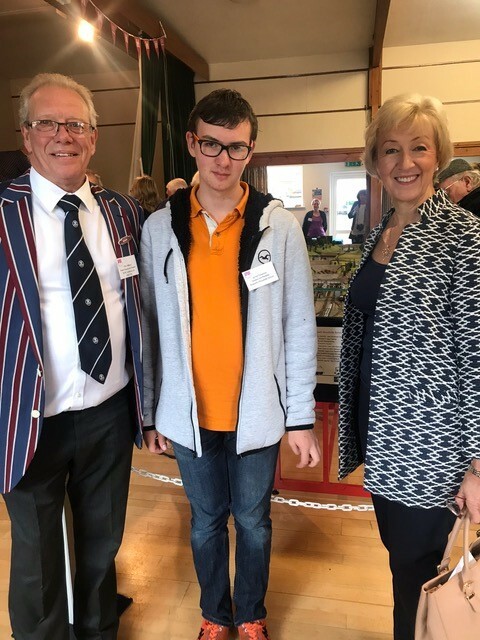 I had the great pleasure of opening the exhibition celebrating the 180th anniversary of the Roade railway cutting which was held over the weekend. Work on the Roade cutting started in 1834 and the line opened in 1838 with a basic station; the cutting played a major part in enabling trains to run from London to Birmingham. The event was one of many Heritage Open Days across Northants, and Roade Local History Society was delighted that over 900 visitors attended over the two days. The Society was pleased to welcome Stuart Wilkinson, Chairman of the Transport Trust, who unveiled the prestigious Red Wheel plaque which recognised the magnificence of the cutting’s Victorian engineering. This fabulous exhibition was truly a “village affair” and involved local schools, talented individuals, the WI and many local businesses; great teamwork from everyone in Roade. One of my favourite parts of the exhibition was viewing the wonderful model that had been prepared of the cutting, produced by History Society members and Elizabeth Woodville school staff and students. Jared Chapman, student at Elizabeth Woodville school, played a key role in developing the model of the Roade cutting. The History Society was helped in staging the exhibition with grants from the Northamptonshire Community Foundation and the Milton Keynes Heritage Association. I’d like to congratulate everyone who was involved in organising this fantastic weekend, particularly those who created the model of the cutting including John Martin (Master Modeller), Peter Mawby (Scale Drawing & Planning), Chris Hillyard (Model Visionary & Modeller), Alan Atkinson (Artwork), John Armitage (3D Designer & Printer), and India Abbott (Research Editor). Well done all!